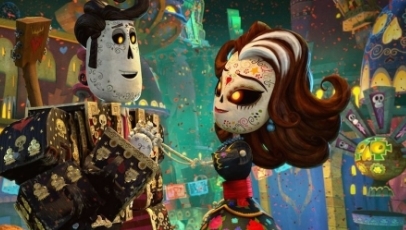 Experienced animator Jorge R. Gutierrez teams up with fan-favourite producer Guillermo Del Toro for his directorial debut The Book Of Life, a visually dazzling but regrettably stale spin on the Mexican holiday Day Of The Dead. Best friends Manola (Diego Luna) and Joaquin (Channing Tatum) have one thing in common: their love for Maria (Zoe Saldana). Using their differing skills, they duke it out for Maria’s affection under the watchful eyes of Xibalba and La Muerta, two powerful mythical entities with an age-old score to settle. If it were down to the visuals alone, then The Book Of Life would be an out-and-out winner. Gutierrez and his skilled animators draw from years of Mexican folklore to feed warmth, colour and spitit on screen. The script, on the other hand, leaves a lot to be desired, scarcely rising above its mechanical and commonplace nature. And that proves to be the films biggest letdown. The Book Of Life shines with vivacity on its surface, but it’s so frustratingly unsophisticated on the inside, laboring to be as commerical as possible – that it ends up being little more than permissable. A longer version of this review was first posted on CineVue.